Picture - A Curtiss-XP-62 on the tarmac. The Curtiss XP-62 was a prototype heavily armed, high-performance, single engine fighter aircraft built for the United States Army Air Corps by the Curtiss-Wright Corporation. During a project review of 1 January 1942, the contract specification was again revised: the loaded weight would be reduced by eliminating four cannon and removing the propeller deicing equipment. Before construction could begin, on 27 July 1942 the contract was terminated as it would affect deliveries of urgently needed Curtiss-built P-47 Thunderbolts. 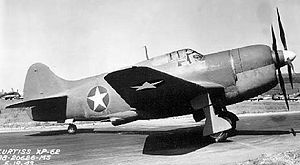 Delays in delivery of the unique pressure-cabin supercharger and engine modifications delayed the first flight of the XP-62 until 21 July 1943. The XP-62A was canceled on 21 September 1943 and only a limited amount of flight testing was conducted with the XP-62. Owing to its low priority work progressed slowly and in the autumn 1942 the XP-62 was scrapped. Because of the insufficient flight testing, full performance charactistics were not obtained. Green, William. War Planes of the Second World War - Fighters, Volume 4. London: Macdonald. 1961.